The ability to walk has been restored following a spinal cord injury, using one’s own brain power, according to research published in the open access Journal of NeuroEngineering and Rehabilitation. The participant later practiced walking while suspended 5cm above ground, so he could freely move his legs without having to support himself. On his 20th visit, he translated these skills to walk on the ground and wore the ZeroG Gait and Balance Training System for aid and to prevent falls. Over the 19 week testing period, he gained more control and performed more tests per visit. The Kessler Foundation acquired the ZeroG Gait and Balance Training System to advance their rehabilitation research for people with disabilities. ZeroG will be used in research by Kessler to help explore new ways to help individuals function more independently at home, the community and in the workplace. 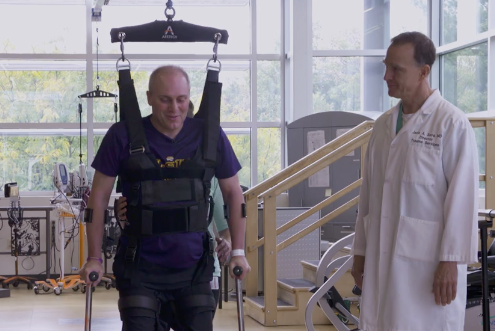 ZeroG, a robotic body-weight support system mounted in an overhead track, allows individuals to engage in rehabilitative activities safely and independently. ZeroG compliments the other technological resources scientists at Kessler are using and will provide real-time data for mobility research. People of various ages, weight and diagnoses can use the ZeroG for many types of functional activities. Participants can safely sit, stand, squat, climb stairs, use an exercise ball and run up to six miles per hour. In ZeroG, they can walk over ground, on a treadmill or in an exoskeleton, without the fear of falling. Via a wireless interface, the device provides real-time data for mobility research, including distance, speed and duration of walking, levels of body-weight support and falls prevented. Activity can be monitored via ZeroG’s touchscreen or a mobile phone or tablet. Kessler Foundation is using ZeroG Version 2, which is more compact and has a higher weight capacity—a maximum of 400 pounds. Version 2 also provides biofeedback to challenge individuals physically and cognitively. A high-resolution display screen features interactive games and target matching activities such as breaking blocks and bobbing and weaving to avoid objects, which increase motivation and encourage participation. The Kessler Foundation is a major nonprofit organization in the field of disability, is a global leader in rehabilitation research that seeks to improve cognition, mobility and long-term outcomes, including employment, for people with neurological disabilities caused by diseases and injuries of the brain and spinal cord. Kessler Foundation leads the nation in funding innovative programs that expand opportunities for employment for people with disabilities. For more information, visit KesslerFoundation.org. Aretech is showcasing Version 2 of the ZeroG Gait and Balance System at the American Physical Therapy Association’s Combined Sections Meeting in Indianapolis, Indiana February 4-7. ZeroG contains many unique features, not found in similar systems which present a significant advancement to therapists in the treatment options for their patients in gait, balance and practicing functional activities. Aretech’s ZeroG is the only robotic overground system using dynamic body-weight support that has interactive balance programs with biofeedback, interactive games played through movements, dynamic fall recovery, treadmill integration and custom harnesses with shaping handles. Safely treat the widest range of patients, with the widest range of diagnoses, across the widest range of activities. Patients can safely begin their walking therapy early after neurological and orthopedic injuries, with early and intensive therapy being the most effective at promoting recovery. Therapy intensity can be modulated with dynamic body-weight support. Biofeedback motivates and cues patients. Lowers the risk of injury to patients and therapists. A single therapist can train even the largest, most impaired patients. Functional activities such as obstacle avoidance, sit-to-stand, floor transfers and stairs can be practiced safely. Monitor and track performance and functional progress. ZeroG has the highest performance, safety and quality in its class with new features to help patients in achieving optimal recovery outcomes. 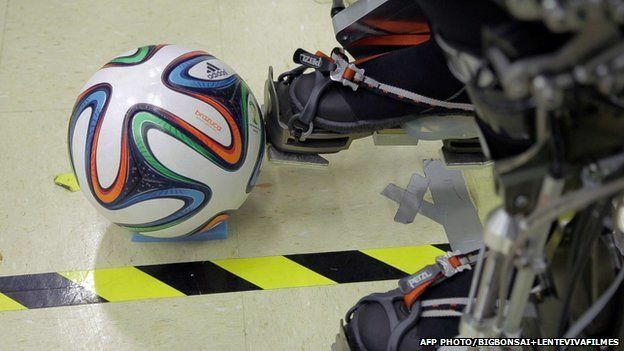 A paraplegic man has made the first kick of the World Cup using a mind-controlled robotic exoskeleton. Juliano Pinto, a 29-year-old with complete paralysis of the lower trunk, performed the symbolic kick-off at the Corinthians Arena in Sao Paulo. Using his robotic suit, Mr Pinto kicked the official ball a short distance along a mat laid down by the touchline. The identity of the young volunteer was kept a secret until after the event. 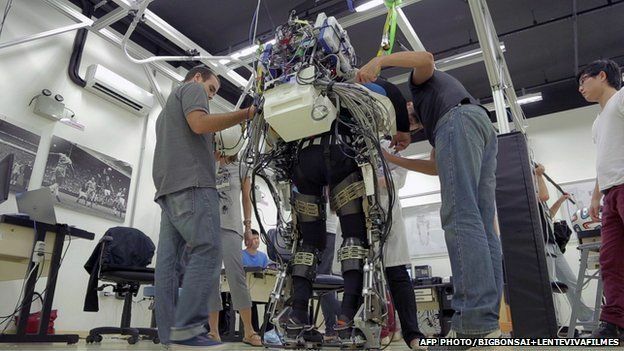 His robotic exoskeleton was created by a team of more than 150 researchers led by Brazilian neuroscientist Dr Miguel Nicolelis. “It was up to Juliano to wear the exoskeleton, but all of them made that shot. It was a big score by these people and by our science,” he commented. The neuroscientist, who is based at Duke University in the US, is a leading figure in the field of brain-machine interfaces. In breakthrough work published in 2003, he showed that monkeys could control the movement of virtual arms on an avatar using just their brain activity. The scientists have been working under the banner of a consortium called the Walk Again Project. In a statement, the consortium said the World Cup demonstration would be “just the beginning” of a future “in which people with paralysis may abandon the wheelchair and literally walk again”. 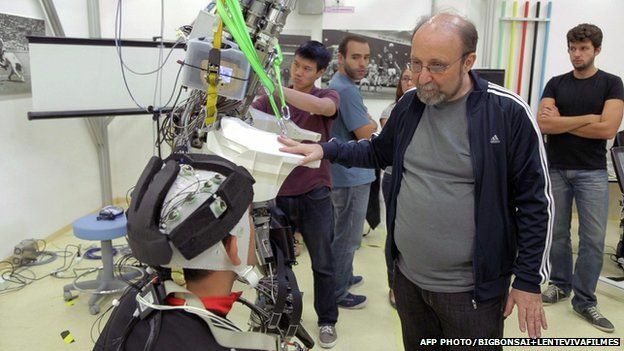 The exoskeleton uses a cap placed on the patient’s head to pick up brain signals and relay them to a computer in the exoskeleton’s backpack. This then decodes the signals and sends them to the legs. The robotic suit is powered by hydraulics, and a battery in the backpack allows for approximately two hours of use. “The basic idea is that we are recording from the brain and then that signal is being translated into commands for the robot to start moving,” Dr Gordon Cheng, at the Technical University of Munich, who is a member of the team, told the BBC in May. Dr Cheng led the development of a form of artificial skin for the exoskeleton. This skin consists of flexible printed circuit boards, each containing pressure, temperature and speed sensors. It is applied on the soles of the feet and allows the patient to receive tactile stimulation when walking with the exoskeleton. When the robotic suit starts to move and touches the ground, signals are transmitted to an electronic vibration device on the patient’s arm, which stimulates their skin. After lots of practice, the brain starts associating the movements of the legs with the vibration in the arm. In theory, the patient should start to develop the sensation that they have legs and that they are walking. The suit has been named Bra-Santos Dumont, which combines the three-letter designation for Brazil and Alberto Santos-Dumont, the aviation pioneer who was born in the country’s southern state of Minas Gerais. 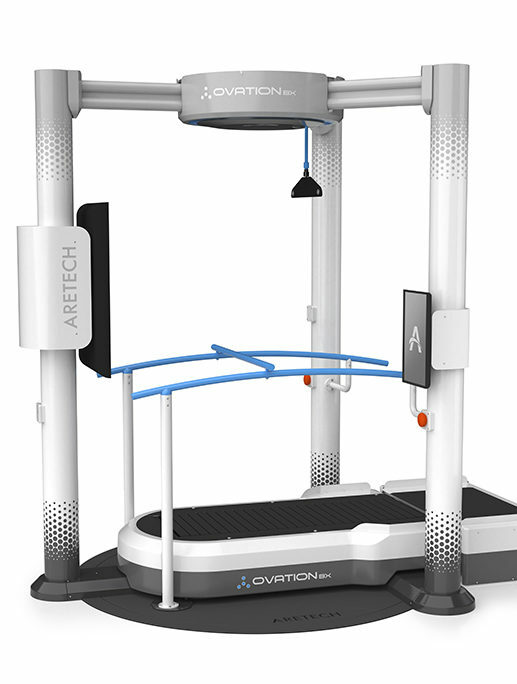 Aretech announced today it has released Version 2 (V.2) of the ZeroG Gait and Balance Training System, which was unveiled last week at the American Physical Therapy Association Combined Sections Meeting in Las Vegas, NV. ZeroG V.2 has the same safety, quality and proven performance1 as the previous version of ZeroG with added innovative features which are the first of their kind in the rehabilitation field. Some of the new features include an anticipatory balance program with biofeedback, the integration of Google GlassTM, larger patient capacity, a smaller and more responsive trolley that supports higher walking speeds, tools for researchers, expanded data recording and enhanced treadmill integration. ZeroG, invented by Aretech CEO, Dr. Joe Hidler, provides patients dynamic body-weight support as they practice walking, balance activities, and other Activities of Daily Living with simultaneous fall protection. With fully integrated Woodway treadmill controls in the ZeroG software, patients can also practice treadmill-based gait training. ZeroG monitors important information at more than 1,000 times per second, so that if a fall is detected, the system can safely catch the patient. And because its trolley rides on a customized ceiling track, there are no barriers between the therapist and the patient. This truly encourages patient-therapist interaction. With a press of a button on a touchscreen computer or wirelessly on a Google NexusTM tablet, therapists can adjust the amount of body-weight support, fall distance, and other parameters in order to modulate the intensity and complexity of each training session. Aretech’s ZeroG Gait and Balance Training System is listed with the Food and Drug Administration and is certified to safety standard IEC 60601-1, 3rd edition. Patients can safely begin their walking therapy early after neurological and orthopedic injuries, with early and intensive therapy being key factors related to the recovery of walking in neurological injuries2. The system provides the highest level of safety to the patient, removing the potential for a fall. ZeroG also reduces the risk of injuries to therapists. Balance activities with biofeedback can be practiced safely with fall protection and dynamic body-weight support. Since the system is ceiling mounted, subjects can practice obstacles such as stairs and uneven terrain, practice sit to stand tasks, and can use assistive devices. ZeroG records training parameters such as patient walking distance, number of falls prevented, min & max body-weight support, and many others. This information can be used to track a patient’s recovery. With fully integrated Woodway treadmill controls, therapists can control all aspects of the training session through a single touch screen interface and can monitor treadmill training parameters such as distance walked, treadmill speed and more.